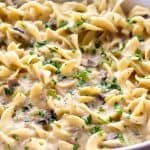 Rich and creamy casserole, easily made in less than 30 minutes. Using sauté setting – add oil, mushrooms, onions, celery, and 1/2 teaspoon of salt to pot and cook for about 5 minutes, until liquid releases from veggies and then evaporates. Add tuna (with liquid) to pot, along with both cans of soup, 1/2 teaspoon of salt, and black pepper. Give and good mix. Then add chicken broth and mix again. Finally, add egg noodles but DO NOT STIR at this point. Gently press down on the noodles – you don’t want too many of them to touch the bottom of the pot, but you do want them submerged as much as possible. Lock lid and cook for 2 minutes at high pressure. Once cook time is complete, quick-release pressure. Then remove lid and add cream cheese. Gently mix until cream cheese is melted, trying not to tear apart the noodles. And that’s it… serve and enjoy!